A school pupil from Yate has helped to design South Gloucestershire Council’s 2014 Christmas card. 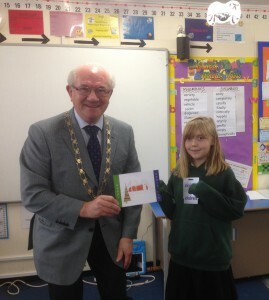 South Gloucestershire Council’s Chairman Cllr Howard Gawler came up with the idea to invite pupils at North Road Community Primary School in Yate to take part in a competition to create a design for the card. The winning Christmas card was designed by nine-year-old Kacey Sheppard, who is currently in year 5 at North Road Community Primary School. Cllr Gawler visited Kacey at the school on Friday 12 December to present her with a shopping voucher as a prize. Cllr Gawler said: “I thought it would be a nice idea to get a local school involved this year and run a competition for pupils to create designs for the council’s Christmas card.